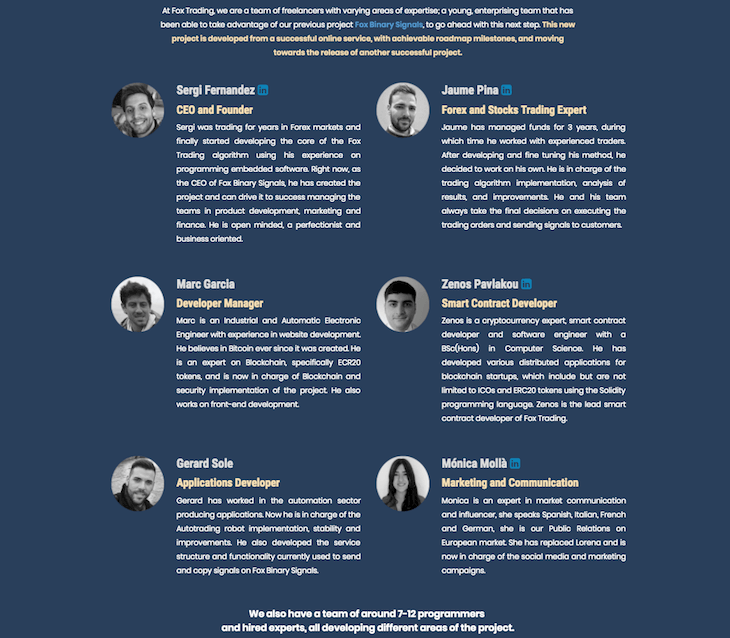 This legit Foxtrading.io review will explain users about what this platform is and what they do. It is a platform that supports both cryptocurrency trading as well as forex stock trading for the users. Customers can freely trade in any currency because the platform runs on blockchain technology, powered by Ethereum. Unlike many other platforms, which require the users to sit in front of a screen all day to trade, it utilizes a smart automatic trading bot that trades on behalf of users! Before this platform, founders of this project were working on Fox Binary Signals – another project to explore binary options trading for the customers. Foxtrading review has been good since then! It is a subsidiary of the company that dealt with Forex market trading back in 2014, and now they have come up with foxtrading.io, with options to trade in cryptocurrency as well as forex market. They do not want to limit themselves to only one domain, which is why they have also entered the much hyped-up cryptocurrency (like Bitcoin) space with a strong history and, experienced personnel who are backing this project. How does Foxtrading.io ICO Work? ICOs and tokens are the most common scam in the crypto market where users are scammed by transactions they do in the fake accounts and amount they deposit, that they end up losing! But not all ICOs are faulty. The customers also have an option to invest in the project, by buying the ICO. The Foxtrading ICO is available in two stages, namely – pre-sale and main sale. ICO pre-sale started on 07th February 2018 and offered around 2.5 million FOXT ICOs for the users to buy at the price of $0.34 each. Minimum purchase amount for the pre-sale was around 0.1 ETH. Immediately after the pre-sale, the main sale started on 10th March 2018 where the remaining Fox Trading ICO tokens or FOXT were sold for $0.54 each. If there are any Fox tokens that are not sold during this period, they will be added to a cap, and sold again, till the price finally reaches at $0.68 per token (which is almost double the pre-sale price of $0.38). The investors who invested in the tokens at an early stage are now reaping their profits and benefits from price hike. ICO aims to fund the project, scale the operations, and expand functionality of the company to different domains. They are focusing on providing the users with a seamless and comfortable experience of trading forex stocks and cryptocurrency, without sticking to a computer screen for 24 hours in a day! They are also spending a lot on maintenance of their hardware. The token prices are almost double now ($0.68) compared to what it was when the pre-sale started ($0.34). Pricing chart has been decided such that in every next round of the sale, the price will jump up by 20%, providing a steady and stable profit to the early investors, as well as adding new investors in the list, thereby promising them an increase in the next sale as well. Finally, in the mid of March, the price increased by almost double the starting amount. It is no less than a bounty program offering lucrative deals to their investors and users! It is a trusted platform, since their predecessor Fox Binary Options, also gained steady popularity among seasoned traders. In many forums and popular discussion groups like bitcointalk, Foxtrade online has good reviews. To start with Foxtrading.io online, you first need to create an account or sign-up using your credentials. Once you sign-up (or become a foxtrader), you will get an email in your registered email account, and you must verify that to access your account. It has enabled algorithm trading for their users, and also launched a trading pool through which users can retrieve their initial principal investment amount at any time, provided the pool is making profit. Moreover, ICO investors do not need to worry about expiration of the membership. They will have lifetime access to the platform, since they are backing up the project itself, by buying the ICO tokens (FOXT). The fees are 0% if the volume is higher, and since limited number of people are using this platform, so the profits are higher and much steady compared to manual trading. They use advanced blockchain platform, which is automated and backed by Ethereum standards (ERC-20). 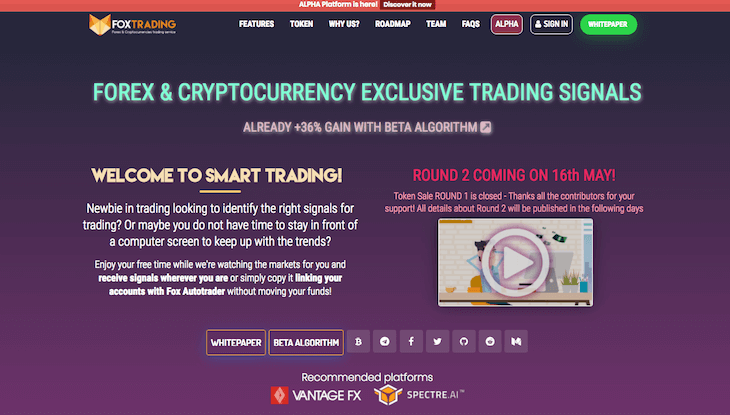 Foxtrading as a platform is an innovative approach towards simplifying and automating the trading mechanism in cryptocurrency as well as forex market. Seasoned traders can set regular alerts and reminders, to trade without actually sitting in front of the computer 24/7. It is an overall healthy platform to allow automatic dealing with advanced and state of the art mechanism.